ODesign, Trustworthy Metal Products Brand for Your Home! 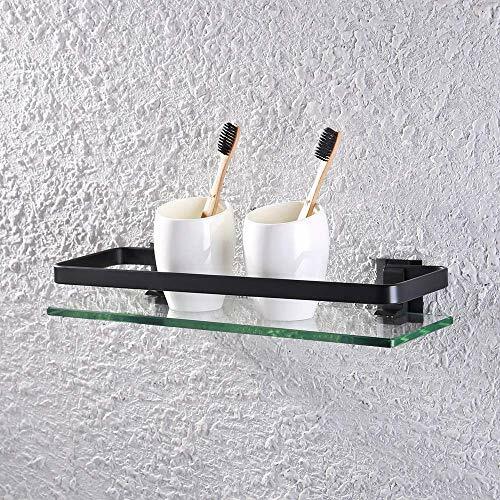 ODesign Adhesive Bathroom Shelf, also can be used as a shower caddy, kitchen spice rack and organizer! 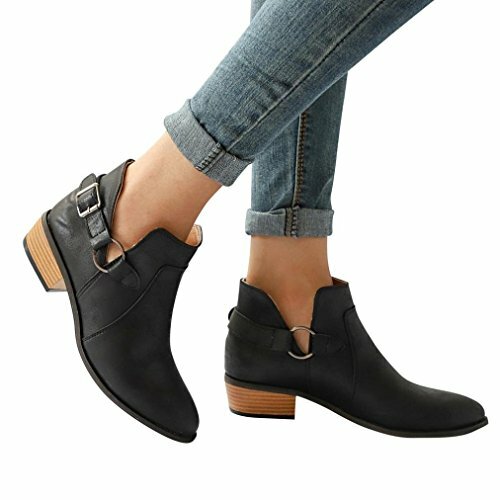 No drilling, rustproof and detachable! 1. Clean surface where need to be installed. 2. Tear off back cover, then apply adhesive on cleaned surface. 3. Hang the storage shelf on hooks. 1. Use the product 24 hours later after installation. 2. If you need to tear off adhesive, please use a hair dryer to heat the adhesive then tear it off. 3. ONLY stick the adhesive on smooth hard surfaces. Please DON'T stick adhesive on painted walls or wallpapers as it will take off your paint or wallpapers. Damage Free: Just peel off the cover to use without drilling walls and requires no additional tools. Large size adhesive, 11.81 x 2.75 inches, ensuring stick the wall firmly. Please note adhesive is not reusable. 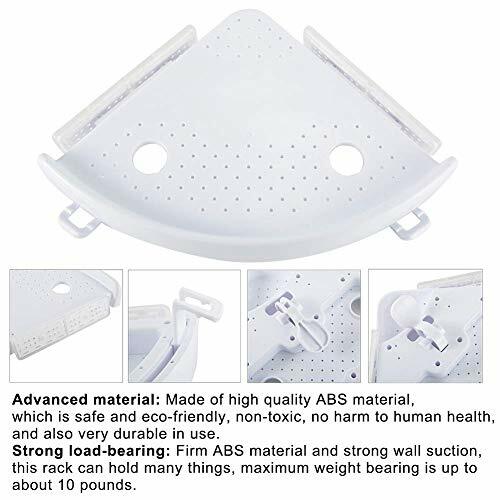 If you need to move install place, you can purchase more adhesive here: https://www.amazon.com/dp/B07DBW9JQK. Detachable Design: The shelf can be recycled and reuse after you take it from adhesive hooks. Durable Material: Premium-grade SUS 304 stainless steel, waterproof and rust protection. Unique transparent adhesive with 3 hooks offering strong bearing capacity. 2 Pack: Widely application meet your different demands. 13.39 x 4.33 x 2.36 inches, large capacity for holding shampoo, conditioner or spice bottle, etc. Ideal for bathrooms, guest bathrooms and powder rooms etc. What You Get: 2 x Bathroom Shelves , 3 x Adhesives, 1 x User Manual, Our friendly customer service and ONE YEAR warranty! [KITCHEN ORGANIZER] This large wall shelf transforms the wasted space into a spacious storage area. Simple and clean lines paired with polished metal texture, this shelf will also give a touch of elegant to your bathroom! [MULTIFUNCTIONAL] Measuring 15.2 by 4.5 in, holds up to 20 lbs, so even heavy and awkwardly sized bottles will fit on this shelf. Rail keeps contents from falling down, towel bar holds your favourite towels. [DURABLE] The tempered glass shelf is extra thick of 0.3 in, can resist most occasional impact, gives the best protection for you and your family. The bracket and towel bar are made of authentic space aluminum, 100% rustproof, ideal for using in the humid bathroom environment. [EASY INSTALLATION] It comes with all needed accessories and an instruction, you could start installation once you have received the package. [CHOOSE VDOMUS, ZERO RISK] This product is tough, durable and rust proof. We care about quality, service and the happiness of our clients, if you're anything less than 100% pleased, we'll make sure things don't stay that way for long. 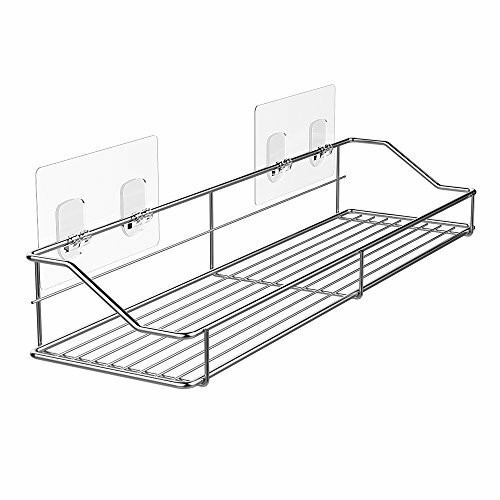 The Organize It All 2-Tier Shelf with Towel Bars is a Chrome 2 tier shelf with towel bars. 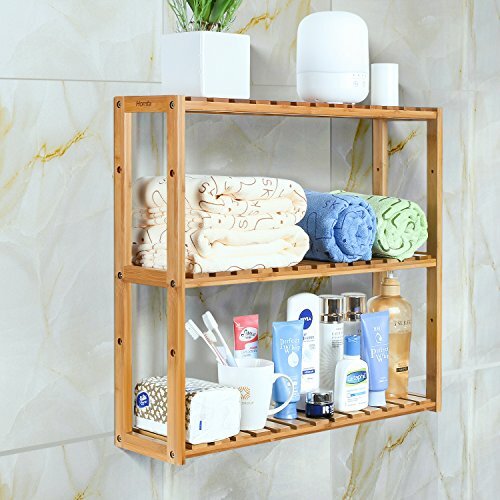 This Homfa Bamboo Rack combines style and functionality to create a modern home furnishing ideal for use in bathroom, living room, kitchen, bedroom or any other space to display and store items. It can be used as a storage rack for storing towels, toiletries, shoes, books and other decorative items. This nice bamboo organizer will well match with your furniture in your home. Stylish and Elegant Design: Made of high grade 100% natural bamboo, healthy and environmental friendly, also bamboo color will make this rack well match with your furniture in your home. Enough space: 3-Tier bamboo rack with suitable height, comfortable for you to take out and put on your clothes or other things, this rack saves space and makes your home neat and well-organized. Safe design: Natural and smooth finish, rounded corners, protect your family from being scratched, especially the children. Convenient for you: Easy to assemble with the hardware, also with the smooth surface, easy to keep clean and maintain. GOOD MATERIAL: Made of 100% natural bamboo Eco-friendly material and some mounting accessories, this storage rack is stable, durable, non-toxic and Eco-friendly. SAFE & EFFICIENT DESIGN: With its smooth surface finish, countersink screws and rounded corners, this shelf will not cause harm to your belongings or your children. And this bamboo rack can be wall mounted or placed on the ground, very convenient and useful. MULTIFUNCTIONAL USE: The bamboo shelf is suitable to be placed in the hall, living room, bedroom, balcony or on the kitchen, bathroom wall. With the 3 tiers bamboo storage shelf you can have enough space to place many your stuffs, such as toiletries, towels, sundries, shoes, books, plants, spice and small appliances, help you organize your home comfortable and tidy. EASY ASSEMBLY: With all the accessories that have been provided, this shelf is easy to assemble and disassembled, and is very space-saving. 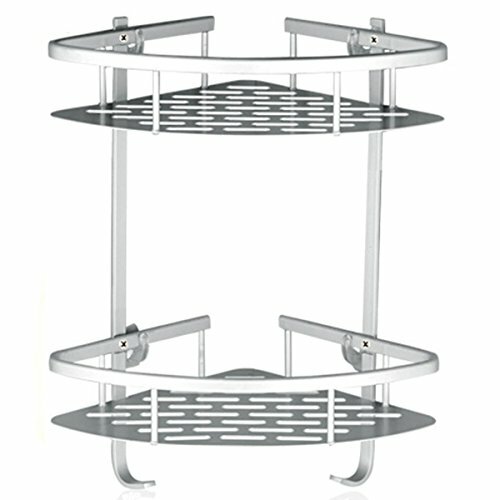 This rack will be helpful for your neat home or office. STORAGE RACK SIZE: 23.6L x 5.9W x 21.3H(60cm X 15cm X 54cm). 1. Clean the area where you want the shelf to be installed. 2. Tear off the protective film on the back, install the adhesive in the area that has been cleaned. 3. Place the shelf in the installation position, pull the shelf down, squeeze the shelf into the groove. It can be used 24 hours after installation. Works on a variety of surfaces. Ideal for bathrooms, cabinet, kitchen to organize your space in neat. Power adhesive making sure attached surface firmly. It made of stainless steel material, it keeps the quality and beauty of the product. Detachable shelf makes it convinient and rational use of space. Even though you tear off the adhesive, the shelf can be recycled and reuse. Unique transparent traceless adhesive design makes it invisible that is perfect for keeping home decoration. Ideal for using it in kitchen, bathrooms and anywhere you like. SUS 304 Stainless steel material, waterproof and rust protection, ensuring aesthetics and durability. What You Get: 1 x Shelf, 3 x Adhesive, 1 x Ruler, our worry-free 12-month warranty, and equally as important -friendly customer service. We want to ensure you are totally happy! HEAVY DUTY: Aluminum constructed posts and rails, ensuring quality and longevity. RUST PROOF: Sand-sprayed finish protects against corrosion & rust. With High-Qualified Stainless Steel construction, this Ello&Allo Wall-Mounted Foldable Bathroom Towel Rack creates a LIGHT duty design to HELP YOU save space and OFFER YOU convenience while showering. Toilet Towel Bar (1 piece), Mounting accessories. One Year Manufacturer's Warranty. Or You can directly contact us, when it occurs to quality issue. 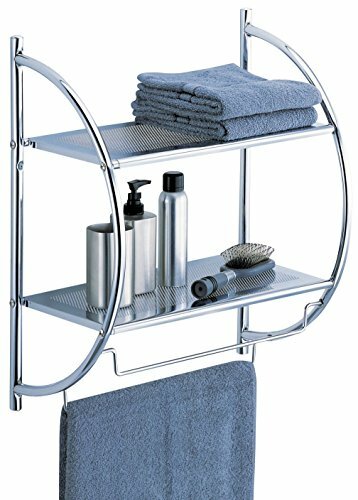 HEAVY DUTY: Bathroom hotel towel shelf offers an elegant, ensuring quality and longevity. 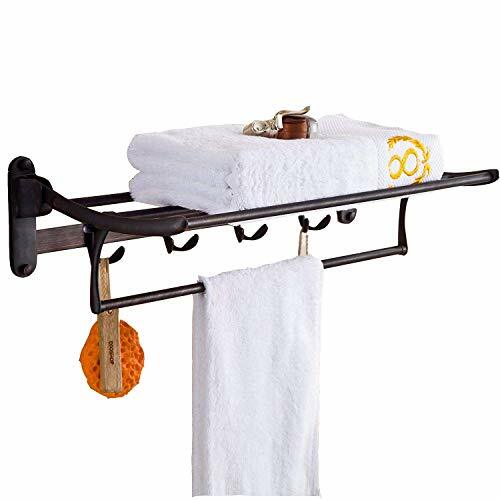 Bathroom Towel Rack: Oil Rubbed Bronze finish, build to resist daily scratches, corrosions and tarnishing. EASY INSTALLATION: Harware pack included. To bring you unbeatable value, Easier to clean. Simply wipe the unit with a soft cotton cloth to remove dust and moisture. BEAUTIFUL: Modern look, concealed screws design. makes it both modern and clean looking. 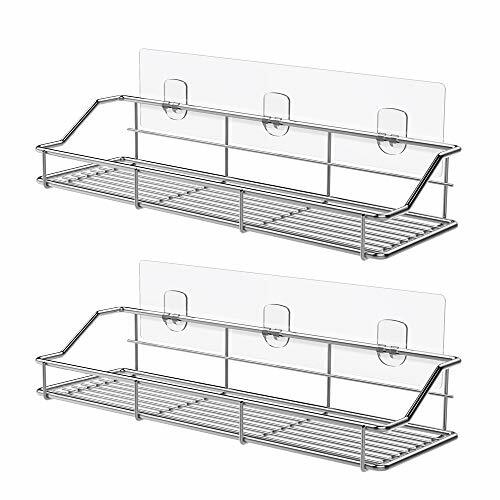 This Glass Shelf with Rail is the perfect choice for cosmetic and toiletry storage. The rail ensures that products and personal care items will stay on the shelf and not end up on the floor. 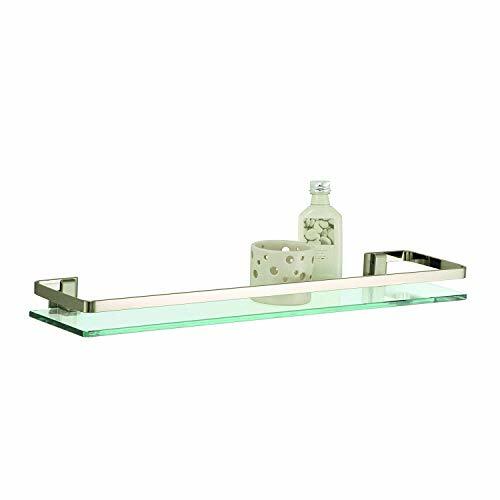 The glass adds a perfect touch to the aesthetic of any bathroom while the shelf's function makes organization much more simple. Organize your bathroom essentials with style!